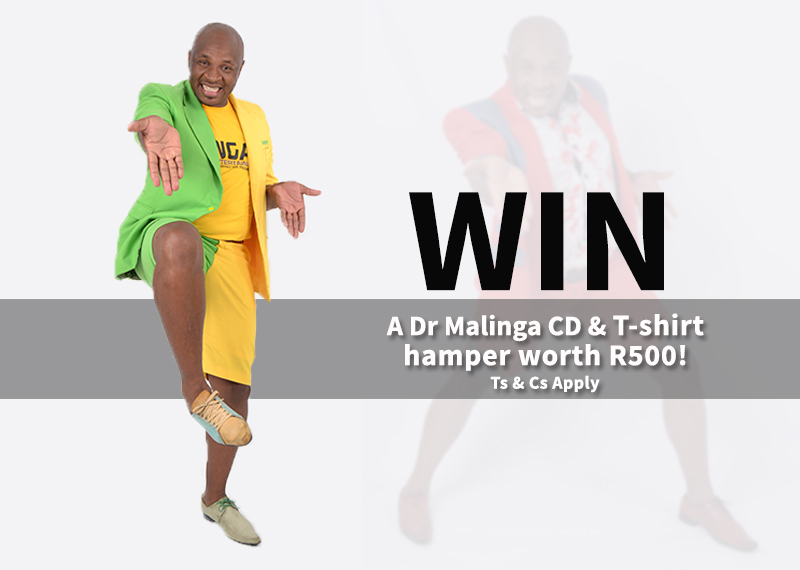 Stand a chance to win a Dr Malinga CD and T-shirt Hamper to the value of R500! To enter post a picture or video of yourself doing the Dr Malinga high kick and share it on the Afternoon Express Facebook page or Tweet us using #AfternoonExpress! The Afternoon Express the Dr Malinga CD and T-shirt Hamper competition ("the Competition") will be run by Cardova Trading Proprietary Limited (registration number: 2010/007686/07) (“the organisers”). The competition is open to all South African citizens and legal residents of South Africa who are 18 years of age or older and permanently reside in the Republic of South Africa, except directors, members, partners, employees, agents or consultants of the organisers and the promoter, or any person who directly or indirectly controls or is controlled by any of the organisers or promoter, including agencies and/or their spouses, life partners, parents, children, brothers, sisters, business partners or associates, and any supplier of any goods or services in connection with the competition. The competition will open on 2 September 2016 at 7pm and close on 19 September 2016 at 6pm ("the competition period"). To enter, entrants need to take a picture or video of yourself doing the Dr Malinga high kick and post it on the Afternoon Express Facebook or Twitter page. Entrants warrant that their entries will not contain any information or material that will infringe any right of any third party in any way and indemnify the organisers and Promoters against any such claims. No automated entries will be allowed and all entries must be made by a natural person manually on the Expresso Twitter page using the relevant hashtag. If any entry was made in a manner which in the organiser's discretion may provide an entrant with an unfair advantage over other entrants, unless these rules specifically allow such conduct, such entrant will be disqualified from this and all future competitions run by the organisers. Entrants will be required to attend to the cost for their entry, including standard internet costs. The Organisers will select (1) original entry/entries from all the entries received as the winners, based on originality and creativity. The winners will be determined based on the Organisers’ sole and unfettered discretion on the closing date of the competition. The Organisers’ decision is final and no correspondence shall be entered into regarding the Organisers’ selection method. The organisers will contact the winners via Twitter or Facebook after the winner has been determined. If the organisers are unable to contact a winner within 5 (five) tries, that winner will forfeit the prize and the organisers reserve the right to determine a new winner under the same conditions. Prizes are not transferable, and cannot be deferred or exchanged for cash or any other item. Prizes are limited to the above description only and does not include any extra not mentioned herein. Winners shall have no claim against the organisers, or any supplier herein, should he or she for any reason whatsoever not receive the prize. The organisers shall contact the winners and provide necessary instructions for the winners to collect the prizes. Entrants agree to provide all information necessary for the issue of the prizes. Winners will use the prize at own risk. The organisers, the Promoters and their agents shall not be liable for any loss (including, without limitation, indirect or consequential loss), damage, personal injury or death which is suffered or sustained (including but not limited to that arising from any person's negligence) in connection with this competition or accepting or using the prize or any part thereof. This competition is in no way sponsored, endorsed or administrated by, or associated with Facebook or Twitter. Entrants herein provide their information to the organisers and not to Facebook or Twitter.